Another historic moment was captured by the Kepler Space Telescope. This photograph is the result of 74 days of observations of the Trappist-1 system, home to seven Earth-like planets located at a distance of 39 light years from us. According to NASA, the observations will help scientists pinpoint the measurements of the six planets of the system, better understand their orbital period and find out the approximate mass of the seventh planet, as well as the magnetic activity of the star. According to NASA, the observation period, known as K2 Campaign 12, provides 74 days of monitoring. This is the longest, nearly continuous set of observations of TRAPPIST-1 yet, and provides researchers with an opportunity to further study the gravitational interaction between the seven planets, and search for planets that may remain undiscovered in the system. The image depicts the location of TRAPPIST-1, an ultra-cool dwarf star home to seven Earth-size planets, in NASA’s Kepler spacecraft’s field of view. The call out box shows the amount of light detected by each pixel in a small section of Kepler’s onboard camera. The light collected from TRAPPIST-1 is visible at the center of the image. Not directly visible are the planets that orbit TRAPPIST-1. The release of the raw, uncalibrated data collected will aid astronomers in preparing proposals due this month to use telescopes on Earth next winter to further investigate TRAPPIST-1. NASA has released the first real picture of the newly discovered solar system TRAPPIST-1, captured by the Kepler spacecraft. The system with seven Earth-sized planets, whose discovery was announced at the end of February, is 39 light years from our planet and is considered by experts as the best shot of finding alien life. According to scientists, all seven planets are very similar to Earth and have oceans of liquid water on their surface. Three of the alien worlds are so perfect that scientists say LIFE may have already evolved on them. The image snapped by the Keppler Space telescope offers a poor and pixellated view of the cool dwarf star, where small irregularities in brightness indicate the presence of planets in transit passing in front of it. The newly published data – currently unprocessed – is the result of 74 days of system observations by the Kepler spacecraft in the framework of the K2 mission from December 15th to the 4th of March. These observations will help scientists pinpoint the measurements of the six planets of the system, better understand their orbital period and find out the approximate mass of the seventh planet, as well as the magnetic activity of the star, says NASA. 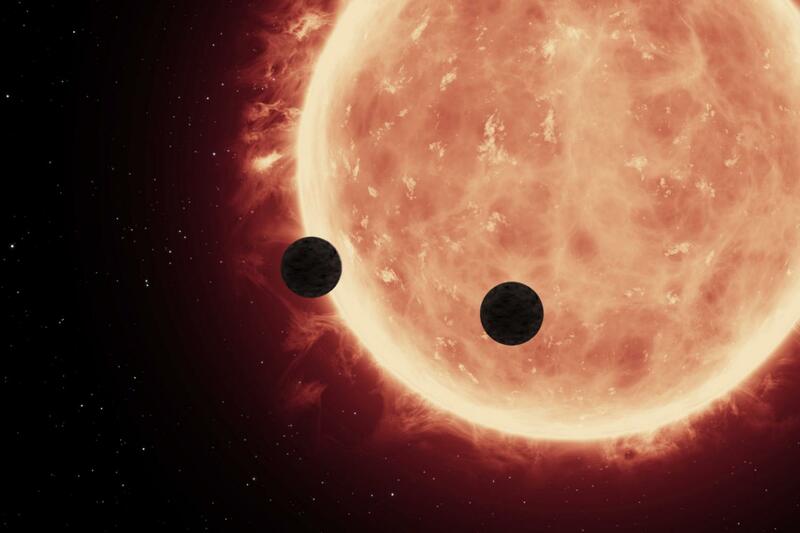 Featured image: This artist’s illustration shows two Earth-sized planets, TRAPPIST-1b and TRAPPIST-1c, passing in front of their parent red dwarf star, which is much smaller and cooler than our sun. NASA’s Hubble Space Telescope looked for signs of atmospheres around these planets.